True Economics: 5/7/15: Votes are in... What's next for Greece? 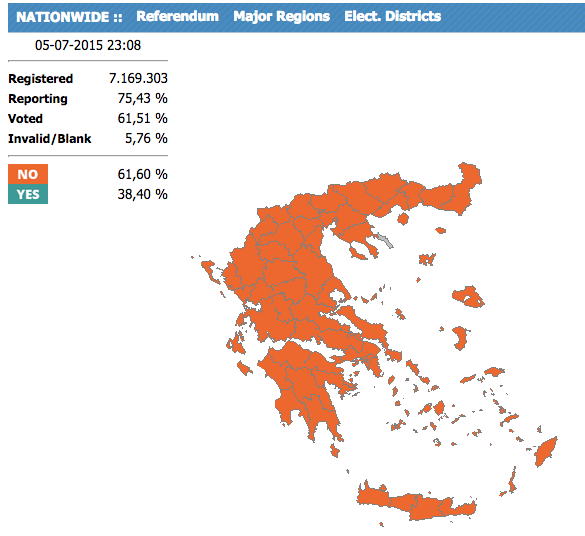 With over 75% of votes counted in the Greek referendum, 61.6% of the votes counted are in favour of 'No'. So what's next? Or rather, what can [we speculate] the 'next' might be? It can take place 'uncooperatively' - with Greece simply monetising itself using new currency (more likely than cooperative Grexit, highly disruptive to all parties involved and accompanied, most likely, by a unilateral/disorderly default on ECB debt, IMF debt, EFSF debt and Samurai debt. Short term default on T-bills also possible). Either form of Grexit will be painful, disruptive and nasty, with any positive outcome heavily conditional on post-Grexit policies (in other words, major reforms). The latter is highly unlikely with present Government in place and in general, given Greek modern history. Grexit - especially disorderly - would likely follow a collapse of the early efforts to get the EU and Greece back to the negotiating table. Such a collapse would take place, most likely, under the strain of political pressures on EU players to play intransigence in the wake of what is clearly a very defiant Greek stance toward the EU 'Institutions' of Troika. Key to avoiding a disorderly / unilateral Grexit will be the IMF's ability to get European members of the Troika to re-engage. This will be tricky, as IMF very clearly staked its own negotiating corner last week by publicly identifying its red-line position in favour of debt relief and massive loans package restructuring. The EU 'Institutions' are clearly in the different camp here. EU Institutions will most likely offer the same deal as pre-referendum. Greece will be 'compelled' to accept it by a threat of ELA withdrawal, but, given the size of the Syriza post-referendum mandate, such position will not be acceptable to Greece. In the short run, ECB can allow ELA lift to facilitate transition to new currency, but such a move would be difficult to structure (ELA mandate is restrictive) and will result in more debt being accumulated by the Greek government that - at the very least - will have to guarantee this increase. Problem with Grexit, however, is that we have no legal mechanism for this, implying that we might need a host of new measures to be prepared and passed across the EU to effect this. In this scenario - no player moves. We have a temporary stalemate. Greece will be cut off from ELA and within a week will need to monetise itself with new currency. Why? Because July 10th there is a T-bill maturing, default on which would trigger a cascade of defaults. Then on July 13th there is another IMF tranche maturing (EUR451 million with interest). Non-payment of either will likely force EFSF to trigger a default clause. Day after, Samurai bonds mature (Yen 20bn) - default here would trigger private sector default. More T-bills come up at July 17th and following that interest on private bonds also comes up on July 19th (EUR225 million). And then we have July 20th - ECB's EUR3.9 billion due, with additional EUR25mln on EIB bonds. Non-payment here will nearly certainly trigger EFSF cross-default. Most likely scenario here would be parallel currency to cover internal bills due, while using euro reserves and receipts to fund external liabilities. Problem is - as parallel currency enters circulation, receipts in euro will fall off precipitously, leading inevitably to a full Grexit and a massive bail-in of depositors prior to that. Political fallout will be nasty. This will suit all parties concerned, but would have been more likely if Greece voted 'Yes' and then crashed the current Government. This is clearly not happening and the mandate for Syriza is now huge. Massive, in fact. So there will have to be a climb-down for the EU sides of the Troika. Most likely climb-down will be a short-term bridge loan to Greece (release of IMF tranche is currently impossible) and allowing use of EFSF funds for general debt redemptions purposes. The New Deal will also involve climb-down by the Greek government, which will, in my view, be forthcoming shortly after Tuesday, especially if ECB does not loosen ELA noose. Bad news is that even if EU side of Troika wants to engage with Greece, such an engagement will probably require approval of German (and others') parliament. Which will require time and can risk breaking up already fragile consensus within the EU. In fact, only consensus building tendency in the wake of today's vote is for a hard stand against Greece. Even in an emergency, EU is very slow to act on developing new 'bailouts' - in Cypriot case it took almost a year to get a deal going. For Portugal - almost 1.5 months. Urgency is on Greek side right now, not EU's, so anyone's guess is as good as mine as to how long it will take for a new deal to emerge. There is no fracturing of the EU consensus (if there is, all bets are off). In a rather possible scenario, EU does opt for a new deal with Greece, which will likely involve pretty much the same conditions as before, but will rely on removing IMF out of the equation altogether. 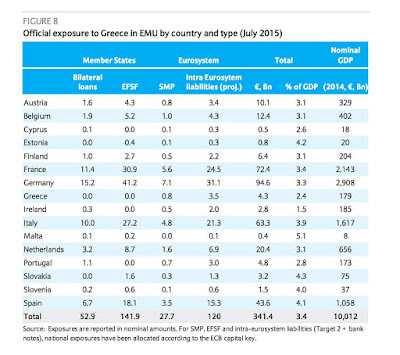 In this case, EUR28.7 billion odd of Greek debt held by the IMF gets transferred to ESM. The same will apply to ECB's EUR19 billion of Greek debt. The result will be to cut Greek interest costs (carrot), and involve stricter conditionality and cross-default clauses (stick). 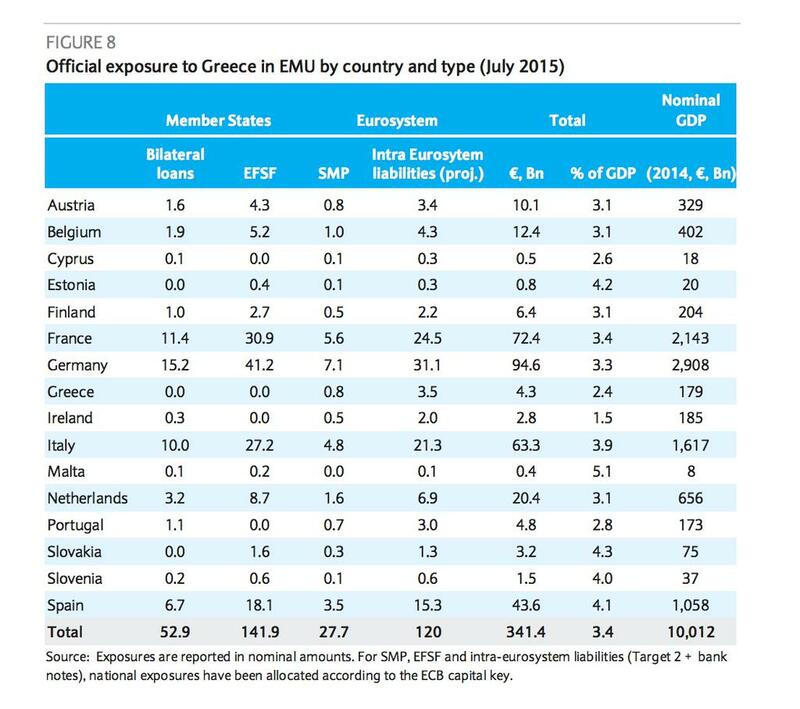 Euro area 'Institutions' therefore will end up holding ca 73% of all Greek debt in that case. Terms restructuring (maturities extension) can further bring down Greek costs in the short run. The negative side of this is that such a restructuring & transfer will be challenged in Germany and Finland, and also possibly in the Netherlands. It is. perhaps, feasible, that a new deal can involve conversion of some liabilities held by the euro area institutions into growth-linked bonds (I am surprised this was refused to start with) and/or a direct conditional commitment (written into a new deal) to future writedowns of debt subject to targets on fiscal performance and reforms being met (again, same surprise here). Still, both measures will be opposed by Germany and other 'core' economies. Either way, two things are certain: One: there will be pain for Greece and Europe; and Two: there will be lots of uncertainty in coming weeks.